Our Newsletter is your VIP ticket to staying up-to-date with EOG's events, announcements and specials. We keep our client list tight and it is not shared with third parties. "A life-changing, perspective-shifting experience. Do this. Ascend hundreds of feet in the air. Place your hand on 200 year-old moss. Sleep suspended safely between two trees.  Laugh with the hilarious Expedition Old Growth crew. Dine on their simple and delicious food. Jump in a frigid mountain stream. Watch trout swim by. You'll come home changed and oh-so-happy.